Please take some time now, login to your TMS, and visit each of links to become familiar with the new offerings. Visit these links often to stay up to date with us and attend our monthly shows. A big thanks to all of our virtual tour providers out there that have made RTV the World’s largest virtual tour company. The first slow down is the Spokane home remodeling and rental business. I have been working my tail off trying to get a rental house of mine put back together. I had what I thought was a real good tenant and they suddenly skipped out on me after a full year of paying their rent on time. After not hearing from him for several weeks I made it over to the house and what do you think I found?? Yes you guessed it my friends. Before me was an abandoned property totally trashed. Upon entering the domicile I quickly discovered a forest growing in the basement. After summoning over Spokane’s finest and having them clear the place out, I was able to finally get on with the usual clean-up and repairs. Thank goodness I was lucky and able to re-rent the place almost immediately. I am sure that getting to be a good landlord is going to be a work in progress for several more years yet. So you can see it has really been a rather daunting task getting my virtual tour business off the ground with such little time. I thought I could go right in and start shooting the 360 shots just like I used too. Unfortunately that has not been the case. There is so much new virtual tour technology to absorb and master now that it has taken a little more time than I thought it was going to take originally. I want it all set up very soon and in a state of readiness that allows me to work without limitations. Deadlines in the distant future have never worked for me, I need pressure to be productive so I have set some crazy deadlines to get this thing off and running, In the past few weeks I’ve been working out pretty much every night in the studio. I have studied up on everything “photography at Real Tour Vision” and now I have gone on to the finishing touches. I actually got all the software working and produced my very first virtual tour in Spokane!! I am very proud of it, looks to me like the exposure is just the way it should be, there is no light fall off. All and all, mastering my new Canon 50D was a breeze and I am very happy with it. This is the first virtual tour of many to come. Good night everyone out there in RTV Land! We are very pleased to announce our new partnership with US Digital Media, a complete media solutions firm. Over the last ten years many of our virtual tour providers have been searching for the best company to meet their CD duplication and media supplies needs. We are happy to have found a firm that is large enough to handle our entire throughput while providing the level of sales and customer support that meets our high standards. From a corporate level we are impressed with the response time and product quality from US Digital Media. It is only natural then that we would recommend US Digital Media’s products and services to our vast RTV virtual tour provider base. The RTV network can rely on US Digital Media’s proven infrastructure to streamline projects by providing Complete Media Solutions all under one roof. US Digital Media is a manufacturer and distributor of digital media storage products and services. As so many of you already know, it is our mission here at RTV to provide you with the very best technology and partnerships to strengthen your property marketing business. Please take a moment now and visit our friends at US Digital Media . We are confident your experience with them will be as enjoyable as our has the past two years. Thanks team! Childcare facilities are an often over looked component of today’s economy. Parents who work, typically spend a great deal of time researching and choosing the daycare facility that meets their unique needs. 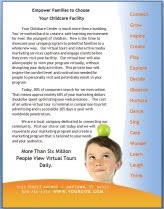 This type of business is a great example of a company that truly benefits from a virtual tour. As you can imagine, having potential customers stopping by during business hours not only would be disruptive to the program but could potentially be unsafe. Virtual tours for a childcare facility allow prospective families to really see the physical environment and then schedule an in person tour. If you haven’t contacted or become familiar with your local Chamber of Commerce then you need to get going. 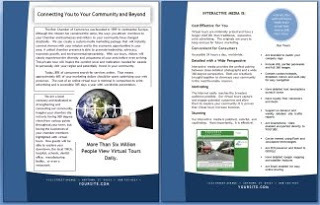 The Chamber is a wealth of connections for a community and potentially an organization that could offer your virtual tours as a part of their membership packages. You might consider doing a free virtual tour for a community so they can see first hand how amazing they really are. The New Angle postcard is a touch more casual and brings the idea that point and shoot cameras do not take professional photographs. It urges potential customers to use your services for all of their professional photography needs. This postcard can use the basic postcard backside. Not Everyone is a Photographer! That really says it all. People like to think they can take a good picture and really, most likely they can when it come to family vacation pictures. 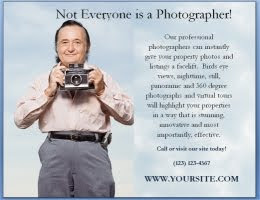 When it comes to advertising or selling, there isn’t a replacement for the skills a professional photographer has. This postcard highlights what unique things you can and will do for a client. This postcard can also use the basic postcard backside. Challenging Designs Inc. is proud to announce “CDI’s S.E.E. Results Package”. S.E.E. stands for “Search Exposure Engine”. And that is what it you do, SEE Results. I was very excited when I attended our bi-weekly seminar online with Jason LaVanture of Real Tour Visions last night. After 2 hours packed with information and 7 pages of notes, I was ready to start putting his teaching to work. I have heard about Exposure Engines and I knew I was going to offer it, but I really wasn’t sure what it was or how I was going to accomplish it. Well, I am a total believer in Jason and RTV!!! First he gives us a wonderful and free software to make the videos then takes us through the process – twice. Now, I know I made mistakes, but after a couple of hours figuring out the quickest way of choosing the photos, making a title page for one client (my guinea pig), and a finale’ page for my company, then going through the all the options, I was hooked! I made the video, uploaded it to YouTube, went into Postlets, etc. Well, at the end, I emailed my client the e-flyer, pdf version of the flyer, the link to YouTube and let him know it was posted to Craigslist, Google, etc. I checked the numbers on his RTV Tour and then I went to bed. This morning, first thing, I get an email from my client telling me how much he LOVED the video and the e-flyer. So I gave it a day and this evening I checked the numbers through his report. I was bowled over! I am definitely making a “checklist” so I can do this as quickly as Jason (I can only hope). CDI’s S.E.E.TM Results Package brought almost 20% as many hits in one night just doing the standard (with a few special tweaks) has done in 2 months! The client is thrilled, the seller will be thrilled and so are we. Jason, thank you. You did it again. You gave me a wonderful product that can help all the Realtors here, if they come to me, of course. Everyone needs to learn how to do this. We just took a giant LEAP in our climb to be the VERY BEST Hot Springs Village virtual tour company!